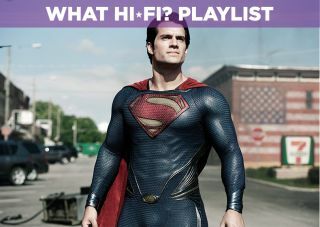 Man of Steel Blu-ray review | What Hi-Fi? It’s not Superman. It’s the story of a man, and the title just happens to be Superman’s nickname. That worked for Batman, after all. You see, in order to be taken seriously, you can’t admit to making a superhero movie. And so Superman is rebooted using The Dark Knight as a template, and the fun disappears with Planet Krypton. Humour and wonder is replaced by ‘realism’, and everything is weighed down with emotional baggage. Clark Kent spends his days as a beardy nomad, wandering to avoid attention. But he always ends up saving the day somewhere and attracting attention anyway. And that, of course, can only lead to more wandering. There are a lot of flashbacks, which look at Superman’s childhood as an alien with limitless power. We like the focus on Superman as an alien. Snippets with Kevin Costner trying to raise a terrified, lethal child are fresh and effective. After a while, the serious approach starts to pay off. Themes of rejection and solitude hint at a more human story, making it easier to care. It seems a two-hour identity crisis isn’t engaging enough, so we revert to Superman, hero with fists. For director Zack Snyder this is means a lot of action. It’s an excuse for drawn-out sequences of utter chaos, where buildings smash in the name of Excitement. There’s a lot of energy in the first few punches, but it rapidly becomes tedious. Around a third of the running time is dedicated to indestructible beings beating the CGI out of each other. Then it just keeps going, and you can’t help but wonder what you ever did to deserve it. To make things worse, the camera is relentlessly shaky. Is it a bird? Is it a plane? It’s hard to tell. We’ve seen more stability from smartphone home videos. Tedium and nausea: that’s time well spent. It’s also a waste of a good character. The lonely, terrified child becomes a generic thug who smashes half a city trying to defeat a single villain. No, it’s definitely not Superman. At least this makes for a good test disc. For all its flaws, the film sounds great, and all those crumbling buildings give your system a good workout in DTS-HD Master Audio 7.1. There’s also a stirring score from Hans Zimmer, even if it’s entirely forgettable filler when compared with John Williams’ iconic original. Fans of big, brash action will probably find plenty to enjoy in Man of Steel. Everyone else should proceed with caution.